I have just watched an interesting video from the US about creating bison preserve (an “American Serengeti”) by buying up ranch land, pulling down fences and creating a vast swathe of territory for bison to roam. The news triggered my to write this short post on restoring wilderness attributes in Europe. There seem to be a fundamental difference between protecting open habitat types in the US and in Europe. What’s done in the US? The prairie (grassland) is recreated on spaces, which used to be prairie. What’s happening in Europe? ‘Natural’ grassland habitats are often created on areas, which used to be forest. Most of the scientific articles agree that Europe was once covered by forest, from the Arctic Ocean to the Mediterranean Sea. The original forest covered probably around 80% of the continent. The open lands were cultivated by our ancestors. This cultivation was of course at that time very extensive! As the population started to grow in Europe, more land was needed for food production (including pastures). As the result of this process, over half of Europe’s original forest cover has disappeared. On average, the forest cover is 1/3 of the total land area (from 11% in Ireland to 72% in Finland). Nowadays most of the agriculture land is intensified, food production is very efficient and due to economic reasons natural reforestation on marginal land started. But we are still very, very far away from the original forest cover. However the natural reforestation is somewhat demonised in Europe. 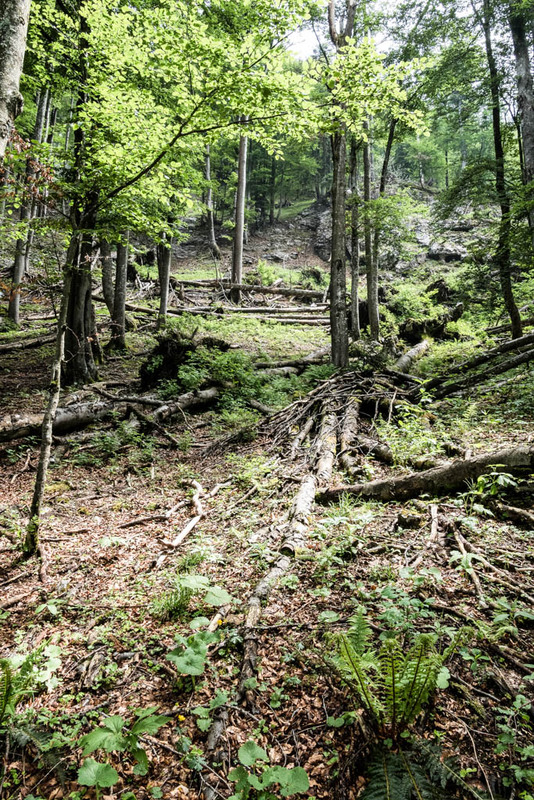 As species, which are dependent on open habitat types decline, some blame the increase of forest cover and want to keep former forest areas clean and open. Large herbivores are used as marketing tools to support this theory. The natural reforestation in Europe offers a unique opportunity to recreate wilderness attributes linked to forests. Don’t stop this process but let it happen! Can we put a fence around Wilderness? this discussion is important, but should not divide conservation aims in “forest” or “open habitats”, as both habitat types are extreme positions of the same long-term cycle of natural dynamics. For conservation issues the proportions of old growth, clearings (opened by catastrophic events) and pases of rejuvenation are the big topic. As most of our forests are heavely fragmented by clearcuts, roads, meadows, settlements etc., the looser are all the species dependend on the so called “inner-forest-climate”. Therefore we need huge forest areas, as just these specialised species are absolut vulnerable for extinction – more than flowers, herbs and birds of the open country, as they have a chance also in man-made landscape. I have good illusrations for this topic, but this automatic system does not accept pictures. Just wondered if there were any bright ideas out there for bringing about a voluntary reduction in the global population? Seems to me the greatest threat to wilderness and the natural environment is from us humans. Maybe I’m wrong… Listening to an American comedian broach the subject of the Global population he suggested about 30,000 humans worldwide ought to be about right instead of 7+ billion..! Is there anyway to “humanise” or contextualise what protecting the wilderness means to humans socially and our everyday lives? Thanks Zolten ! Your post opens many issues and may attracts diverse comments. I see many differences between North America and Europe, such as in the dimension of spaces used my man (much higher land use pressure in Europe), or the different starting points in conservation: In the US, politicians and idealists wanted to save wild landscapes for the enjoyment of societies, while in Europe this ambition has originally been limited to aristocrats securing their personal hunting and property priviledges. Today in Europe, reforestation (or rather afforestation) is in most cases connected to economic land use interests, and emotionally (genetically coded?) forests are perceived as dark and dangerous: That’s why we have so many forest roads and orientation signs. “Let the nature do the work” is a challenge for Europeans.